As always, we’ve been led by our collected curiosity here at FvF, exploring the depths of the web to bring you this latest Link List. We’ve watched former FvF interviewee Benjamin Bratton speak with science fiction writer Bruce Sterling about his novels including the one most quoted in the Trump era, and we’ve raged at the idea of the sad white man epidemic “uniquely” affected by loneliness. Read on for this, and more, below. “Projects (Try to escape the flying shells, dodging)” is how Wu-Tang Clan put it in their 1997 track The Projects. This piece by Jacobin Magazine’s staff writer Meagan Day, paints a grim image of public housing in American culture. By depicting international, especially European examples, Day demystifies the notion that this form of housing is dangerous or something one needs to escape. Yet, without policies, regulation, and a new approach for the US, such projects can’t fulfill their purpose: “Housing not as an ultimatum between privatized commodity and public threadbare charity, but as a social good guaranteed by a state that sees quality shelter as a right of all people,” Day reasons. “It’s just a new way of thinking.” That’s what it says in The Projects, too, though. What springs to mind when picturing the ballet? Tutus, a certain softness, graceful movements, and Edgar Degas’ impressionist depictions of, well, female dancers? You might not think of it as a home for queer artists and narratives, and neither does the industry, as T Magazine’s How a Group of Gay Male Ballet Dancers Is Rethinking Masculinity points out: The world of dance’s idea of its male protagonists is often that of hypermasculine individuals, while it rarely depicts relationships between men. The insightful piece captures encounters with seven gay dancers and the challenges they face and denies the notion that queerness doesn’t belong onstage. How have we come to embrace the idea that truth no longer exists? In a recent article on Real Life Mag social media theorist Nathan Jurgenson follows the historical discourse on fake news, alternative facts, and the approaching “infocalypse” to ask a justified question: “If the feeling that you don’t know what is real and true isn’t so new, but rather a running commentary throughout all of modernity, why is this meme so viral now?” There’s a chance that the helpless descriptions of reality as “bizarre” show that we haven’t quite understood how the world has become unknowable to us. 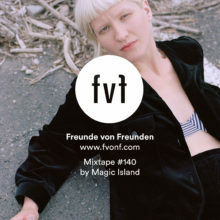 Also, be sure to check out FvF Mixtapes for some tracks selected by our friends and favorite artists, and subscribe to our newsletter to stay up-to-date with FvF stories.